Danish silversmith. 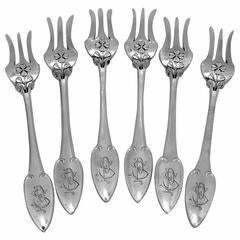 Set of 4 cake forks in silver, 1930. Stamped. In very good condition. Measures: 14 cm. Pair of sterling silver handled carving fork and knife set, circa 1950s. Measures: Fork 8.75" L x 1.5" W x .75" H. Marked: Sterling.